I recently saw your transcript of a 1995 radio interview in which Fr. Malachi Martin talked about the Third Secret of Fatima. I am sending you the text of another radio show in 1998. Would you please comment on it also? Art Bell: "Not long ago, someone sent me what they said was the third secret of Fatima. You have read the third secret?" Malachi Martin: "Early A.M., February 1960 - before I read it I had to take a vow not to reveal it. It would be a shock, no doubt, some would become very angry." A.B. : (addressing his radio audience) "E-mail it to me, post haste, please, I've lost it! I've lost it. On March 14, 1998, I read it over the air - it's alleged to be the 3rd secret." (Someone in the radio audience sent it, and he reads the alleged 3rd secret which appeared in 1963 in the German newspaper, Neues Europa). M.M. : "It is not the text given to me to read in 1960. There are elements in it that belong in the text of the 3rd secret - that's the most measured response I could give to it. The real 3rd secret is much more traumatic than what you've just read. The central element is awful - it's not in what you've just read." A.B. : -"Should it be revealed?" M.M. : "I'm one small man but I have no authority to do that. I can't make that decision... It would have such dire effects, on much more than Christians. The Cardinal who showed it to me had been present at a meeting with Pope John XXIII to outline to a certain number of Cardinals what should be done with the secret. He, John XXIII, thought it would ruin his ongoing negotiations with Khrushchev and the Kremlin. Also, he had a different outlook on life, which two years later he echoed very succinctly, and almost contemptuous. On October 11, 1962, at the opening of Vatican II at St. Peter's, he derided most contemptuously the people who he called 'the prophets of doom,' and there was no doubt in our minds that he was talking about the prophecy of Fatima. He was against that. What is in the secret is more horrible than what you've just read: essentially, the onslaught of natural powers...terrible catastrophes, chastisements, and that's not the essence of the 3rd secret; it’s not the frightening one." A.B. : "I understand, it would be such a shock." M.M. : "I have no authority, no angel has tapped me on the shoulder, I may be putting my foot in my mouth... Besides, it's a question of shock, of frightening people, of polarizing society. I can't do that... this will fill up the confessionals on Saturday evening. It will fill up the churches with worshippers striking their breasts." A.B. : "How much weight do you give to the Fatima revelations?" M.M. : "I consider Fatima to be the key event in the declining fortune of the Roman Catholic organization for the near future of the Church in the third millennium, the defining event... In Rome there are men among the great... with strong wills, all their lives engaged in macro-government, not merely in religion, but in state... They would not touch this with a ten foot pole... Pope John Paul II is an ardent supporter of a one world government… He wants to bring in his brand of Christianity, of course. To the UN he said, 'I am a member of humanity.' This is no longer Pius IX and Pius X (who said) 'I am the vicar of Christ.' Completely absent is the Kingship of Christ... I imagine the person who wrote what you read to me had privy to the original text – yes – at least by word of mouth." M.M. : "Yes, I would, I wouldn't lie." A.B. : "So you don't recognize what I read." M.M. : Not as part of that one sheet of paper. Thank you for sending TIA the transcript of Fr. Malachi Martin’s interesting responses to questions from Art Bell on the Third Secret of Fatima. I introduced numbers to the answers so that my comments on them can be more easily followed. 1. In his first answer, Fr. Martin says that there is something “more traumatic” in the real Third Secret; he goes on to say that its “central element is awful.” What could this central element be if not the apostasy in the Church and the apostasy of the Pope himself? One can surmise that this was the “traumatic” and “awful” part to which Fr. Martin was referring, which was not in the text published by Neues Europa. Now then, this apostasy is mentioned in the document released in April 2010. 2. In his second answer, when asked why he himself would not take the initiative of revealing the Secret, Fr. Martin said he did not have the authority to make that decision and, immediately after, he began to report what John XXIII did. It seems implied that a part of his oath was to let the Pope decide when to reveal the Secret. Then, he said John XXIII thought that to reveal the Secret could harm Vatican relations with the Kremlin. Now, at the time, those relations were moving toward the Pact of Metz, which led to the participation of members of the Russian Schismatic Church, controlled by the Communist regime, at Vatican II as observers. One condition they demanded for such participation was that Communism should not be condemned at the Council. How could the revelation of the Third Secret harm those relations? If the authentic Secret were to say something like, “Let it be known that God forbids the Pope to take steps that compromise with Communism,” then obviously its release would be harmful. It is certainly more harmful than what is written in the April 2010 Secret, which makes no mention of Russia, the Kremlin or Communism. However, if the April Third Secret were the authentic one and if it had been released on the authority of John XXIII - as Fr. Martin implied it should be - it would necessarily call attention to the previous messages of Fatima, wherein Our Lady clearly spoke of Russia spreading its errors throughout the world. So, if John XXIII had been faithful and revealed the Third Secret – an apostasy in the Church that includes the Pope - he would have had to give up his policy of rapprochement with Communism as well as his progressivist agenda, or he would identify himself with the evil Pope described in it. Fr. Martin then gave us a tip as to when that meeting of Cardinals with the Pope took place. He said, “Two years later … in October 1962.” So that meeting took place in 1960. In his introductory words, Fr. Martin told the audience that he had read the Secret in February 1960. Since he spoke of that meeting in the past tense – “The Cardinal who showed it to me had been present at a meeting with Pope John XXIII” – we can surmise that the meeting took place some time in the two first months of 1960. It seems that John XXIII held that meeting specifically to inform the Cardinals that he would not release the Secret in 1960. Again, in the April 2010 text, Sister Lucia tells the Pope to announce the Secret by 1960. Next, Fr. Martin took a clear position against John XXIII, revealing that his famous complaint about the “prophets of doom” at the opening of Vatican II was a straightforward reference to the prophecy of Fatima. Fr. Martin then said that the “essence of the Third Secret” was not an unleashing of natural disasters. Anyone who has a little practice in analyzing the way Jesuits speak would say that Fr. Martin was giving a tip about what that mysterious essence was: The Pope himself would be part of the apostasy, just as he had previously described regarding John XXIII. We know that the April 2010 Secret also says this, in a symbolic way. 3. The interviewer insisted that Fr. Martin reveal the Secret. He repeated that he had no authority to do so. Then, to escape the pressure, he gave another reason to remain silent that sheds light on the reason Our Lady wanted the Pope to announce it. He said that the goal of the Secret was to shock people and cause their conversion. He added that the churches would be filled with penitents for Saturday evening confession if it were revealed. At the first reading of these comments I thought: “Well, finally here is something that does not correspond to the April Secret because it makes no reference to the conversion or anything else that could bring people to the confessionals in droves.” Then, thinking a little, I could see that Fr. Martin was saying that no one person by himself revealing the Secret could produce that desired effect. What he implies is that the Secret was meant to be revealed by the Pope and, therefore, using all the means of the Church to spread it and to explain what that apostasy was. Then, each one – the Pope, Cardinals, Bishops, priests and people – could recognize what part he had played in it and ask God’s forgiveness so he would not go to Hell. If the Secret were made known in this way, then all the previous messages of Sister Lucy would come together as an ensemble - including the one in which Our Lady asks for the First Saturdays reparation. This would shed light on why Fr. Martin surmised that the churches would be filled with penitent people. 4. In stating how central he believed the Fatima message is for the Church in the third millennium, Fr. Martin criticizes the fear of the powerful men at the Vatican. He generalizes, as if he were saying, “No one has the courage to reveal the Secret of Fatima.” Then he makes a specific criticism of John Paul II’s support for the UN. He ends by clearly affirming that what JPII taught was different from what had been taught by previous Popes. 6. Here he confirms that the True Secret was written on just one sheet of paper. 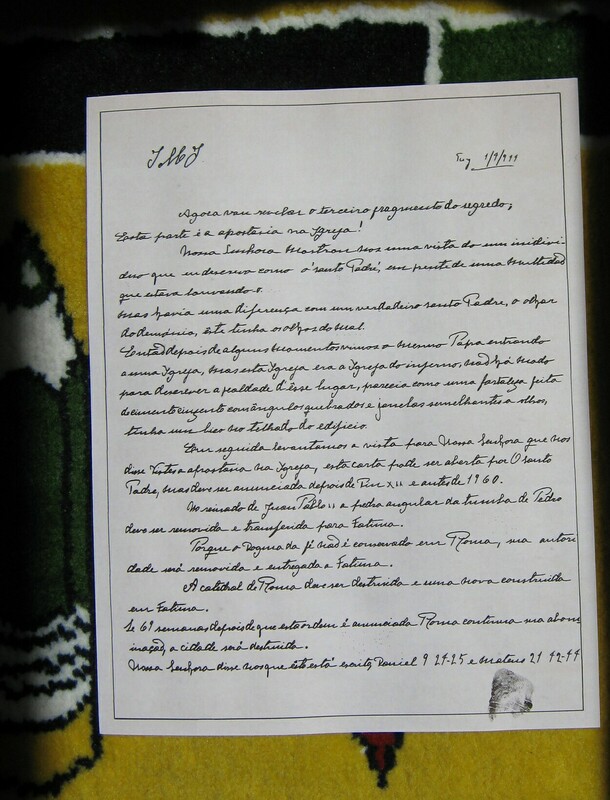 The April 2010 text is on one sheet of paper, which speaks in its favor. I hope these considerations will help you. Third Secret: It is Fake! It is Authentic!